I spent a really fun and productive day in my dye studio clamping, resisting and dyeing small pieces of silk organza and chiffon that I can piece together for doing some small, nuno-felted scarves. For now, I've set them out on my table and am enjoying looking at the natural dye colors and thinking about which combinations I will use. I took a few quick photos, arranging the pieces in different ways. Here they are! Every two years the Fuller Craft Museum in Brockton, MA has a juried exhibition of members' work. What the heck -- I thought I'd submit the two rugs I wove this spring and summer (see last blog post). I was delighted to hear that both rugs were accepted and will be hung in the show. Click on this link for more information. The show runs from Sept. 22nd until February 10th. Here's another show opening later this month at the Fuller that will interest you weavers out there. Meanwhile... the fields are hayed, the days are shortening, there's a chill in the night air, and we're enjoying the last of our garden's produce. Summer has been full of wonderful distractions, but I'm looking forward to a new burst of creativity this fall and winter. I've been on a steep learning curve with rug weaving and have been making many samples -- using Peter Collingwood's book as guidance -- in order to get a handle on weft-faced rugs. Mostly I've been playing with twills and block weaves. I did plan and finish one rug, pictured below, which was to be used in an upstairs hallway. Alas, I discovered that the scale really changes from the design on paper to when the rug is on the floor, so I have found another spot for it. I dyed all of the wool using natural dyes. The brown comes from black walnuts that I found in our field last fall, the reds are cochineal and madder, and the yellows and greens marigold. Here's another rug that I wove during a workshop at Peter's Valley Craft Center in New Jersey a couple of weeks ago. I have admired Connie Forneris' rugs forever, and I jumped at the opportunity to take a workshop with her. It was an intense 5 days of dyeing 5 lbs of wool in brutal heat, then setting up the looms and weaving. I learned so much that will be invaluable as I proceed on my rug-weaving journey. 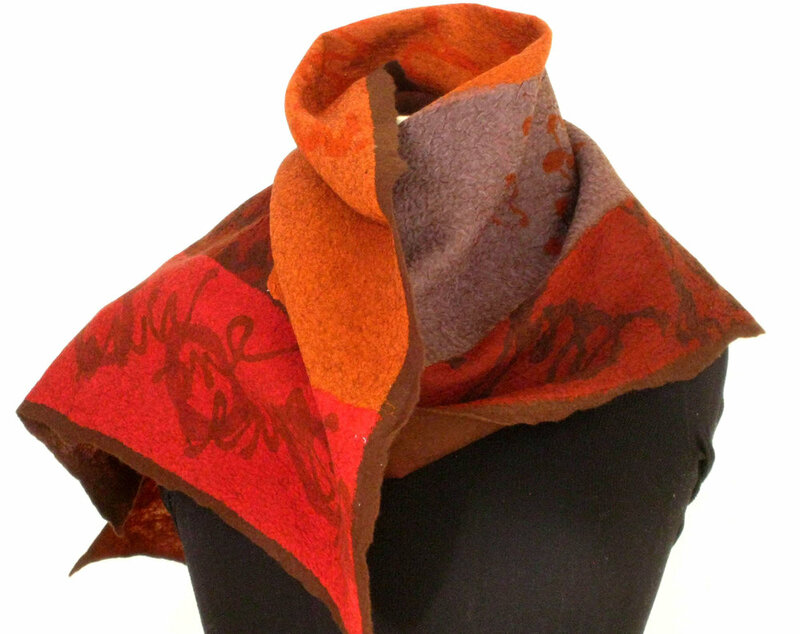 I had so much fun making the nuno scarves for the TEXTiles show that I kept going. This time I used only natural dyes with itajime (clamp and resist). Here's what I have so far. I may keep going with this, but need to give my shoulders a rest from all of the rolling. These scarves are quite light as I used a merino pre-felt. An invitational group exhibit, "TEXTiles" will be opening next week at the Silk Weaving Studio in Vancouver. 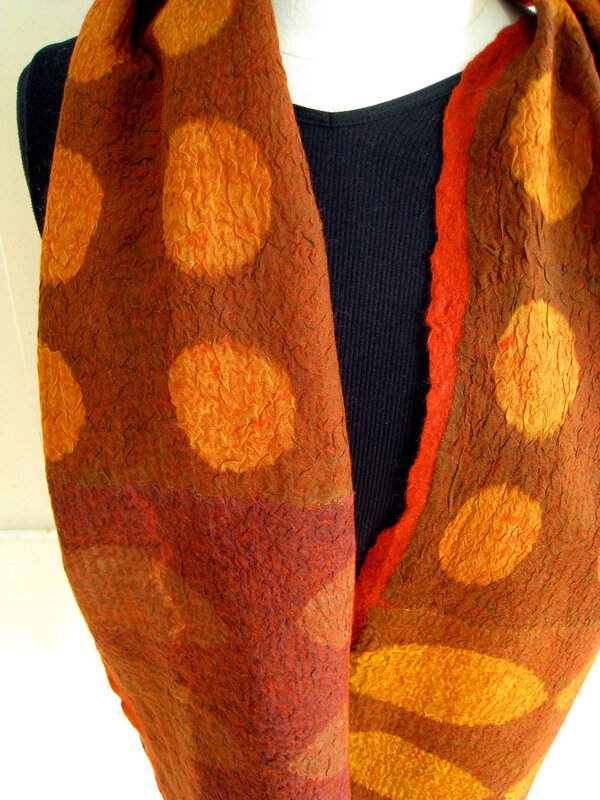 I have several new pieces in the show -- printed and dyed silk nuno felted onto merino. Click here for the opening announcement. Here are a few the pieces I made for the show. An ongoing project which will undoubtedly take me right into the winter is weaving several hall runners. I've decided to go with natural dyes, of course, which means I have to mordant and dye about 8 or 9 lbs of wool per runner. I'm looking forward to many hours stirring dyepots and enjoying the wonderful aroma of those natural dyes. So far I have sampled and planned my first runner. Here's a shot of the colors I've dyed and a sketch or two of what I have in mind. I'm planning to do weft-faced twills, each rug in a different pattern with colors pulling them all together.